Machine quilting thread is both functional and decorative, and the best machine quilting thread for one project may not work as well for another. Quilting threads hold the layers of the quilt sandwich together securely, making indents in the project wherever the stitches are sewn. The indents and the thread both add a decorative finish to the quilt. Many types of threads can be used for machine quilting, and quilting thread can either contrast or blend with the fabrics used to make the quilt. If fabrics are busy and eye-catching, consider a quilting thread that blends into the surface design, so that the viewer's eye will remain focused on the fabric and design of the quilt. If you prefer, quilting designs and machine quilting threads can become a focal point of the quilt. Quilting threads can be made from natural fibers such as wool, silk, cotton, flax, and jute. Some threads are regenerated from cellulose and others are made from synthetic fibers, such as metallic, polyester, and nylon threads. Cotton, metallic and rayon are among the most popular threads used for machine quilting. Rayon and cotton threads come in different weights. Metallic threads are in their own class with their own special features (and sometimes their own special frustrations). Thread weight is usually stamped on the edge of the spool or printed on the top or bottom of the spool. Sewing thread becomes heavier as weight designations decrease. Heavier weight threads are more noticeable when they are used for quilting. A 40 weight thread is a popular choice for quilting while 30 weight threads are more visible. Lighter 50 weight threads usually blend into the fabric. Thread weight is only one of many factors to consider when selecting machine quilting thread. Will the thread's color blend with the fabrics or stand out to make quilting an important part of the design? Consider whether you prefer the matte finish of a cotton thread, the shine of a rayon thread or the glimmer of a metallic thread. Choose threads that you like, get the right needle for each type of thread and give the thread a tryout. Trying different threads on your sewing machine will probably require some adjustments to the machine's tension. Adjusting the tension is not something to fear, and can make your quilting life much easier if you are willing to experiment. Be sure to start each project with a new needle. As you thread your sewing machine, notice the different places where the thread must pass through or over a bar or between discs because all of these encounters create tension on the thread. Use a needle with an eye that allows the thread to pass through it easily, such as a metallic needle with a longer eye for metallic threads or a topstitch or quilting needle (sized 90/14 for 30 weight or 40 weight threads). You should research machine needle sizes if you're unsure which needle is the best choice. Make a small practice quilt sandwich and take a few stitches. Adjust the tension if you find that stitches are too loose. Ideally, your bobbin thread and top thread should meet in the middle of the layers—learn about sewing machine tension adjustments and troubleshooting. If your top thread is visible on the bottom of the quilt, your top tension is too loose. If your bobbin thread is visible on the top of your quilt, your top tension is too tight. Keep testing and adjusting until you find the right balance. 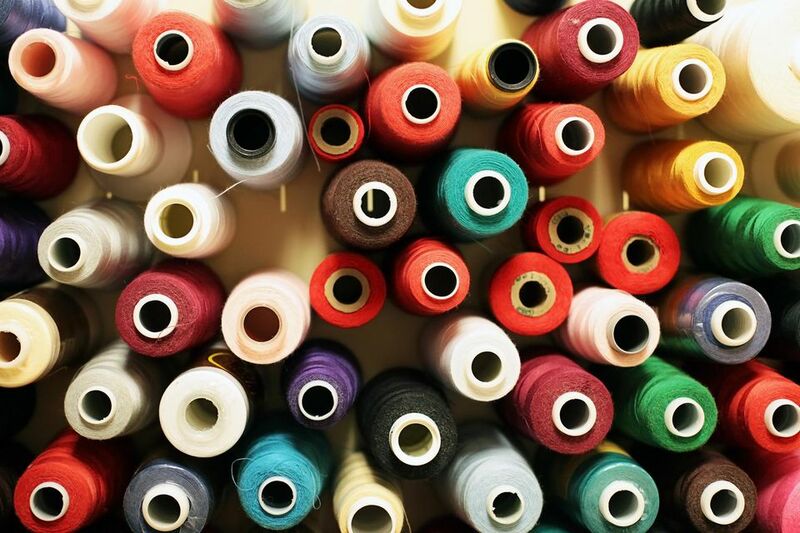 Make sure you are using a bobbin thread that works well with the quilting thread—manufacturers usually include that information with the thread descriptions or on their websites.